Walter Gieseking grew up in France and Italy. In 1911 his parents moved to Hanover and there Karl Leimer was his piano teacher at the conservatory, where he studied from 1911 to 1916. After the First World War his career took off and he performed in Europe and, in 1926, in the USA. He lived in Wiesbaden and in 1937 he was Adolf Hitler made him a professor. During the Second World War he lived in Germany and continued his performances. He was accused of collaboraton with the nazis by Vladimir Horowitz and Arthur Rubinstein. In 1947 he was allowed to resume his career and he became professor at the Hochschule für Musik Saar in Saarbrücken. He held this post until his death in 1956. 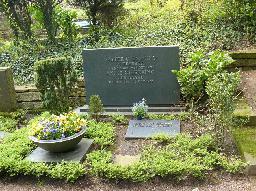 The grave of Walter Gieseking at the Nordfriedhof, Wiesbaden.